Pan Fried Pork Chops made with only 5 ingredients! A scrumptious recipe that’ll be on your dinner table in 15 minutes, featuring a mouthwatering golden crust with no marinating or breading required. 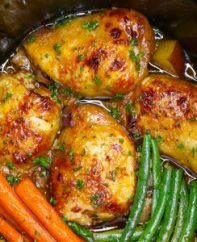 Perfect for a quick weeknight dinner or entertaining for a party! Pork chops are an easy lunch or dinner idea that’s less expensive than steak and just as flavorful. 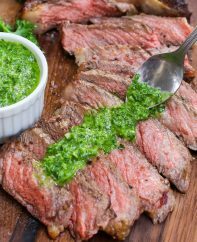 You can make a tender and juicy meal that everyone will love by following a few simple tips, and forget about dry and tasteless chops forever! You can serve these pork chops with just a green vegetable or salad for a low-carb dinner idea. Add in some mashed potatoes or rice to get a complete meal. For a party feast, just add in more sides like coleslaw, corn on the cob or mac and cheese. So good! Pan frying pork chops need not be complicated. The secret is to start with thick, bone-in pork chops as with Baked Pork Chops. The only ingredients you’ll need are pork chops, seasoning, some olive oil and optional minced parsley for garnish. Salt is the main tenderizer here, and you’ll need about 1 teaspoon of salt for 4 pork chops. Combine ¼ cup salt (4 tablespoons) with 1 quart of water in a 9×13 baking pan. Add the chops in a single layer and let sit for 30-60 minutes. Drain, pat dry with paper towels and continue with the recipe. Contrary to popular belief, the salt from the brine washes away and does not accumulate on the meat. Mix the seasonings in a small bowl or ziplock bag. Then rub the mixture all over the pork chops using your fingers. When Are Pork Chops Done? Pork chops are cooked when the internal temperature reaches 145°F / 63°C. It’s fine to still have some faint wisps of pink color in the meat. Select thick, bone-in rib chops for the juiciest texture and most flavor. Avoid thin chops and/or boneless chops. Remove the pork chops from the fridge 15-30 minutes in advance, and pat dry with paper towels to remove excess moisture. Season each side of the pork chops with salt and pepper for flavor and tenderizing. Use a cast iron frying pan and sear at high heat for only 2-3 minutes to lock in the juices and form a golden crust. Then reduce heat to medium-low for the remaining time. Don’t poke or stab the chops, which will cause the precious juices to leak out. Check for doneness using an instant meat thermometer and remove from heat as soon as the internal temperature reaches the 145°F / 63°C. When cooked, allow the chops to rest for several minutes before serving so the juices retreat back into the meat. Cover loosely with foil to keep warm. Cast iron skillet: A cast iron frying pan like this one will help create an even crust on the pork chops. Kitchen tongs: Tongs are helpful for easily flipping the pork chops, or you can use a spatula. Thermometer: An instant thermometer helps avoid overcooking the meat. 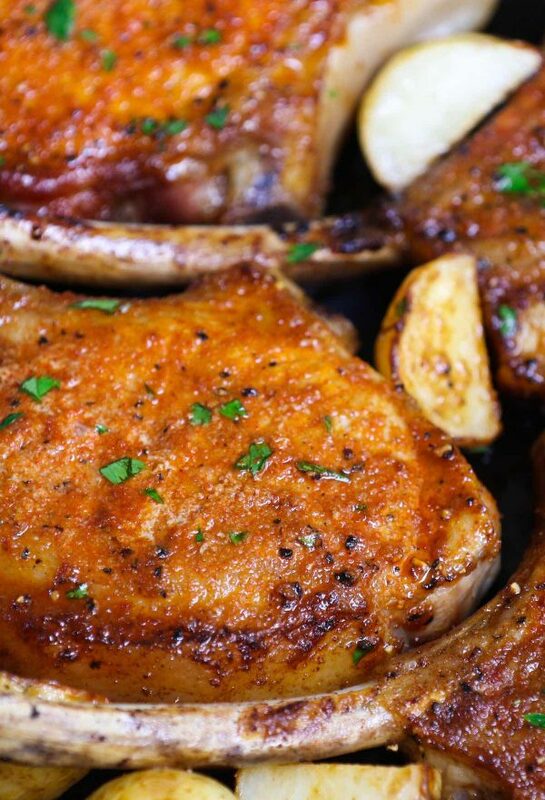 These Pan Fried Pork Chops are a scrumptious, no-nonsense pork chop recipe that’ll be on your dinner table with just 5 ingredients. There’s no marinating or breading required. Perfect for dinner or entertaining! In a small bowl, combine garlic powder, paprika, salt and black pepper. Rub the seasoning mixture over all sides of each pork chop. Place a large cast iron skillet over medium heat and add the olive oil. Once the pan is hot, add the pork chops and fry for 2-3 minutes per side to sear. Insert an instant-read meat thermometer into the middle of a chop. Once it reads 145°F (63°C), remove the chops to a plate. Let the pork chops rest for 4-5 minutes. Garnish with optional minced parsley. Serve and enjoy! 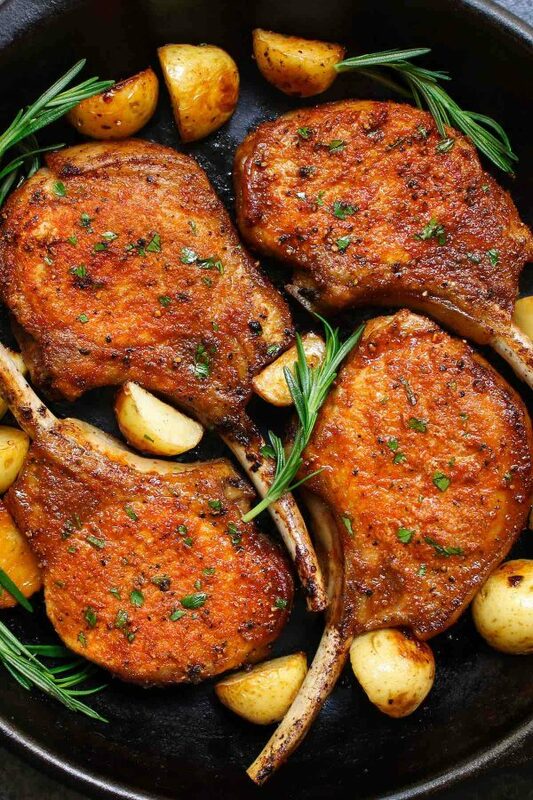 Thick-cut pork chops are less likely to dry out than thinner chops. I recommend buying pork chops that are at least 1-inch thick to get tender and juicy results. Salt brings out the natural flavor of pork chops, but if you prefer less salt, you can add 1 tsp to the seasoning, and add more to taste during serving. If the center of your pork chop is slightly pink after cooking, it’s ok as long as the internal temperature reaches 145°F (63°C). 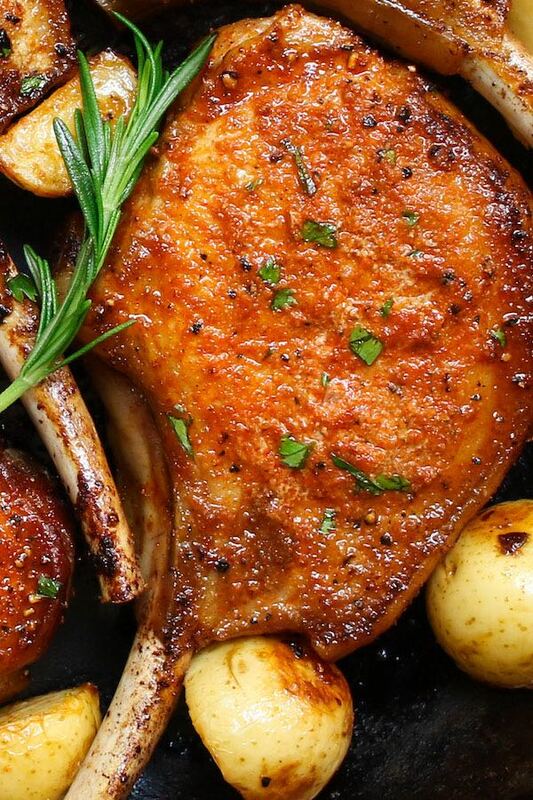 Looking for more pork chop recipes? What temperature do you pre heat oven? 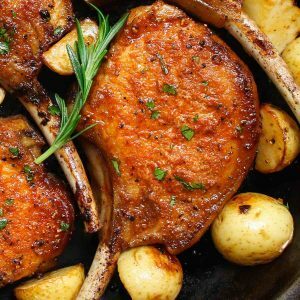 Lovely pork chops recipe! 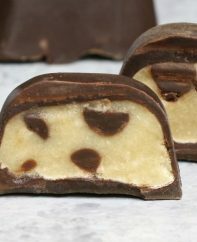 We tried it last night, is was very flavorful and quick to make. I’m confused it says to bake them in the recipe. Reading the top comment you say they are pan fried. How long do you pan fry them on each side? //Recipe says to “bake” for 15 minutes. However this is a recipe for “pan-fried” pork chops. Am I missing something here? Thanks.